Back in September I had the pleasure of meeting Domenica Marchetti from Domenica Cooks. She was here in Portland for her book The Glorious Vegetables from Italy at Feast Portland, the food festival. She is a very talented and successful cookbook author with many lovely books. This tour was about her Glorious Vegetables book. I had the honor of baking this cake for her book signing for guests to sample. Typically authors bring snacks from their books, and she was travelling without time to bake cakes to bring to the event. I happily baked them for her and so glad I did. This is an Italian cake with beautiful flavors. I am a huge fan and bake them for so many occasions now because it is also very easy to make, no equipment needed. This is the perfect holiday cake for any gathering. Serve it for dessert for Christmas, breakfast for guests, afternoon tea, really for any event all year, but super special for this season. 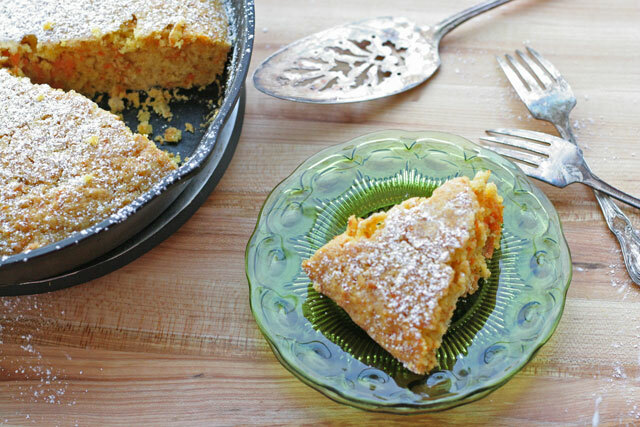 The citrus and carrots in this cake are warming flavors, perfect with a cup of coffee or tea. I also have a major thing for olive oil cakes, and my cast iron pan, so that’s what I baked it in. It is very easy to make and you can even make it ahead of time, freeze it for up to a month, take it out the day you need it, bring to room temperature on the counter, ready for an evening with family and friends. It is also so quick and easy, it takes under 30 minutes to prepare, so you can make it the day you need it! You can find this and other amazing recipes in Domenica’s Book. This book was recently chosen as a New York Times Notable Cookbook for 2013, how amazing is that?!!! I baked this cake in a 9 inch cast iron pan prepared with olive oil. 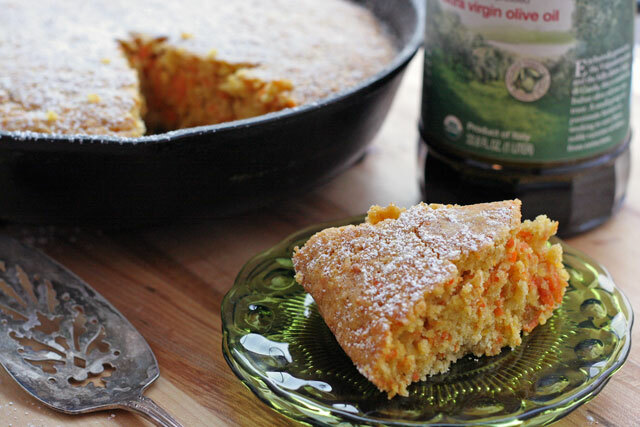 You can use an 8 inch cake pan, square or round, prepared with olive oil. 1. In a large bowl sift all purpose flour, cornmeal, baking powder, salt, and nutmeg. In a medium bowl combine olive oil, marsala wine, eggs, sugar, and zest, mix well. Add the shredded carrots to the liquid, mix well. 2. Add the liquid/carrot mixture to the dry ingredients. Using a spatula mix the wet with the dry, but be sure not to over mix, just mix to combine. Pour cake batter using the spatula into prepared pan and bake for 35 minutes. Remove from pan if you did not use the cast iron pan, cool on a cooling rack. Allow cake to cool at least 30 minutes before cutting into to serve. Dust with confectioner sugar to serve. I am ALWAYS on the search for new Carrot Cake recipes and your looks soooo fun. Can’t wait to try it out. And look forward to meeting you at the Big Potluck in April. Cheers. Awesome! Let me know how you like it. I look for award to meeting you! Thanks for stopping by.